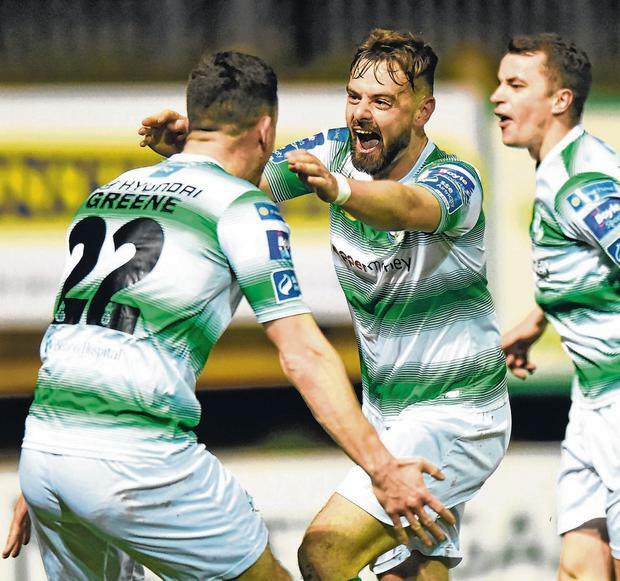 Table-toppers Shamrock Rovers grabbed a dramatic win over Finn Harps at Finn Park with Greg Bolger's 85th-minute pile-driver from the edge of the box proving decisive. This result puts Rovers seven points clear at the summit while Harps are still seeking their first win. But it was rough justice on the battling Donegal side who will feel that they merited a share of the spoils. The Hoops had three players away on international duty - Jack Byrne (senior), Trevor Clarke and Brandon Kavanagh (both U-21s) - but declined to avail of the option of getting the game postponed. 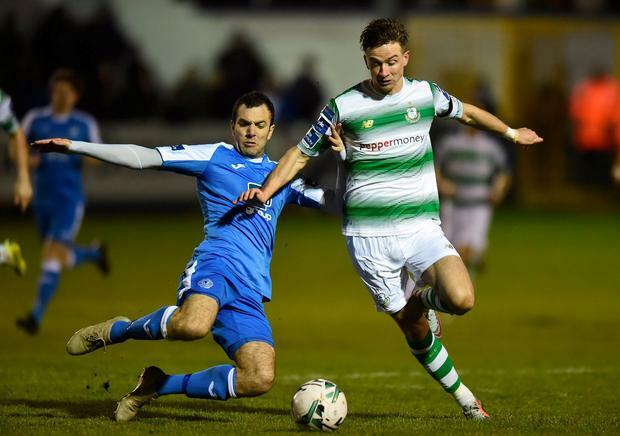 Rovers, who had already beaten Harps 3-0 in Tallaght earlier this month, started slowly. 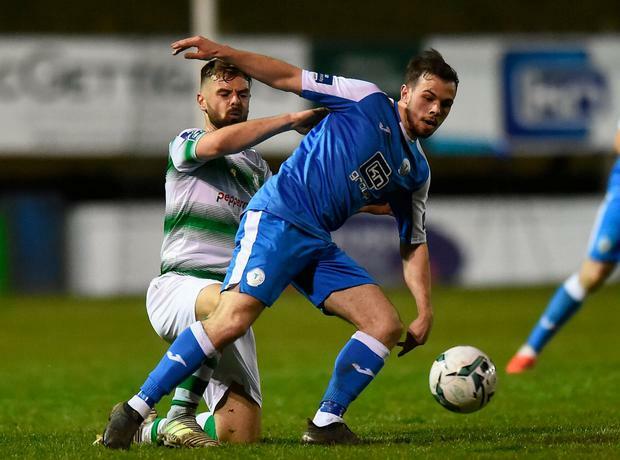 Indeed, Harps had the first chance of note on 13 minutes when Caolan McAleer sent a free deep into the box but Daniel O'Reilly was unable to make the telling connection at the other end. Dan Carr wasn't far away from connecting with an Aaron Greene cross for Rovers but Harps had the better of the early exchanges. It took Rovers 18 minutes before they first tested Ciaran Gallagher who got down well to save a Dylan Watts strike after a neat exchange of passes. Watts fired over from inside the box for Rovers on 35 minutes, but that was their last chance in a first 45 minutes that struggled to come to life. Certainly, Harps boss Ollie Horgan - who had to watch this one from the stands as he is serving a three-game ban - would have been the happier manager at the break. Harps had a scare right after the re-start when goalkeeper Ciaran Gallagher spilled a Joey O'Brien cross but Keith Cowan was on hand to clear. Greene had the ball in the net shortly afterwards but he was clearly off-side. Nathan Boyle was nearly in for Harps on 73 minutes but Alan Mannus was quickly off his line to intervene. In a tense final 10 minutes both teams pushed for a winner and Bolger obliged after a short spell of pressure as the ball fell 20 yards out. A minute's silence was observed before the game in memory of the late Brian Wright who scored Finn Harps' first senior goal when they were beaten 10-2 by Shamrock Rovers at Finn Park in August 1969. Next up for Harps is a long trip to Waterford and they then have seven games in April. Life back in the top flight will not be getting any easier for the Donegal club. Finn Harps - Gallagher; Todd, Cowan, Logue; Deasy, Kavanagh, Coyle, Borg (Cretaro, 69 mins), O'Reilly; Boyle (Place, 82), McAleer. Shamrock Rovers - Mannus; O'Brien, Lopes, Grace, Kavanagh; Watts, Finn, Bolger, McEneff (Coustrain, 66); Greene (Bone, 86), Carr (Vojic, 75). REF - D Tomney (Dublin). 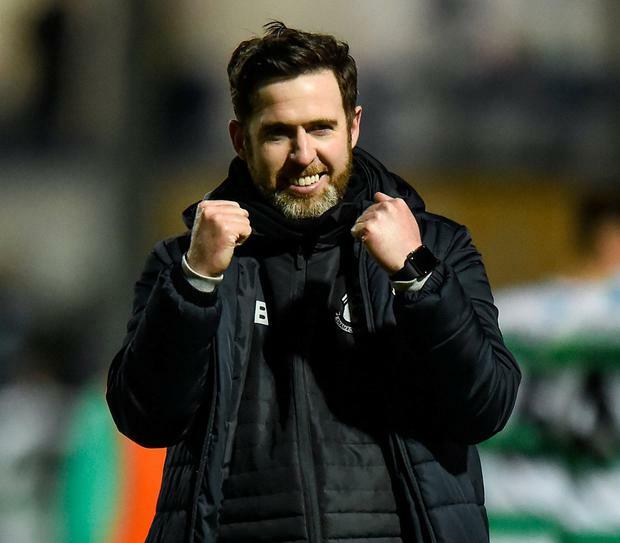 Daniel McDonnell If Tuesday's Dublin derby in Tallaght opened a window to what is possible for Irish football, subsequent developments have highlighted how persistent dysfunction can shut down optimism.